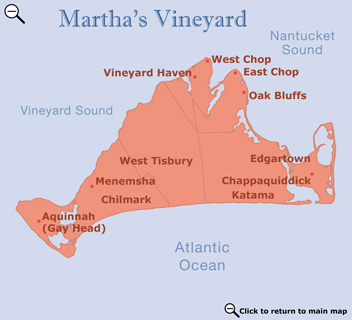 South of Edgartown is the area known as Katama. At the end of Katama Road is a three-mile barrier beach called South Beach, with surf on one side and protected salt pond on the other side. Noted for its exciting surf, Katama is a surfer's paradise. It is a pleasant bike ride from Edgartown to South Beach along a 4-mile bike path. The streets of Edgartown, the island's first colonial settlement, are lined with upscale shops, art galleries, and fine restaurants. Many of the stately homes are the former residences of whaling captains. The population is approximately 4,000 locals year round. In the summer months, the population can grow to 35,000. Edgartown's stately Greek Revival houses, many of them carefully restored sea captains' homes, are surrounded by well-manicured lawns and gardens. A stroll down the historic streets will introduce you to Edgartown's architecture of solely white homes and buildings per town ordinance. The Old Whaling Church on Main Street is a beautiful six columned building built in 1843. This landmark has been restored and now hosts performing arts productions, weddings or private parties. Also on Main Street is the Vincent House Museum, built in 1672 and the oldest dwelling on Martha's Vineyard. Lighthouse Beach is a pretty place to walk from town to enjoy the calm water or watch boats travel in and out of the harbor. The 200-acre Felix Neck Wildlife Sanctuary is about three miles from downtown. Owned by the Massachusetts Audubon Society, this nature center provides miles of trails and water fowl and turtle ponds, and offers conservation education year round. Edgartown is one of the Vineyard's two towns where the purchase of alcohol is legal.